Plants glabrous or nearly so. 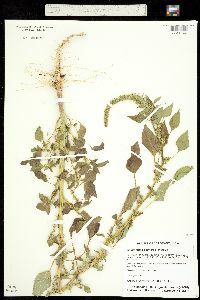 Stems erect, branched, usually (0.3-)0.5-1.5(-3) m; proximal branches often ascending. Leaves: long-petiolate; blade obovate or rhombic-obovate to elliptic proximally, sometimes lanceolate distally, 1.5-7 × 1-3.5 cm, base broadly to narrowly cuneate, margins entire, plane, apex subobtuse to acute, usually with terminal mucro. Inflorescences terminal, linear spikes to panicles, usually drooping, occasionally erect, especially when young, with few axillary clusters, uninterrupted or interrupted in proximal part of plant. Bracts: of pistillate flowers with long-excurrent midrib, 4-6 mm, longer than tepals, apex acuminate or mucronulate; of staminate flowers, 4 mm, equaling or longer than outer tepals, apex long-acuminate. Pistillate flowers: tepals 1.7-3.8 mm, apex acuminate, mucronulate; style branches spreading; stigmas 2(-3). Staminate flowers: tepals 5, unequal, 2-4 mm, apex acute; inner tepals with prominent midrib excurrent as rigid spine, apex long-acuminate or mucronulate; stamens 5. Utricles tan to brown, occasionally reddish brown, obovoid to subglobose, 1.5-2 mm, shorter than tepals, at maturity walls thin, almost smooth or indistinctly rugose. Seeds dark reddish brown to brown, 1-1.2 mm diam., shiny. Flowering summer-fall, occasionally spring-winter in southern part of its native range. Streambanks, disturbed habitats, especially agricultural fields, railroads, waste areas, roadsides; 100-1000 m; Ont. ; Ariz., Ark., Calif., Colo., Fla., Ga., Ill., Kans., Ky., La., Md., Mass., Miss., Mo., Nebr., Nev., N.J., N.Mex., N.Y., N.C., Ohio, Okla., Pa., S.C., Tenn., Tex., Utah, Va., W.Va., Wis.; Mexico; introduced Europe, Asia, and Australia. 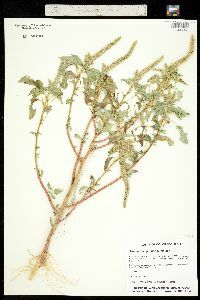 Originally native to the North American Southwest, from southern California to Texas and northern Mexico, Amaranthus palmeri at present is a successful invasive species, which is evident from its expansion both in eastern North America and overseas. Because of its rapid spread, the distribution data presented here are probably incomplete. Duration: Annual Nativity: Native Lifeform: Forb/Herb General: Annual herb, usually erect with a well-developed main axis, 0.2-3 m tall, the height and growth form highly variable depending on soil moisture; herbage glabrous or sparsely pubescent but not glandular. 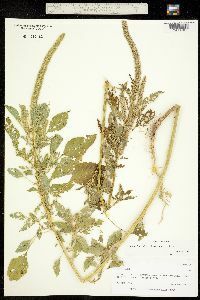 Leaves: Alternate and long-petiolate, the petioles 1-8 cm; blades mostly lanceolate, highly variable in size, 3-12 cm, the lower stem leaves largest and soon deciduous. Flowers: Green and white, occasionally pink-tinged, in terminal linear spikes, these leafless or nearly so, indeterminate, long, and slender, the tips usually drooping; also occasional short clusters of flowers in leaf axils. 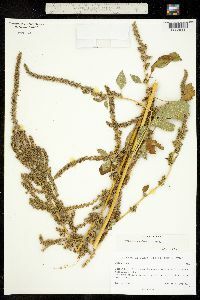 Plants dioeceous (separate male and female plants). Spikes composed of many small flower clusters, each cluster subtended by a bract. Pistillate bracts with long-excurrent midrib, 4-6 mm, longer than tepals; staminate bracts 4 mm, equaling or longer than outer tepals, apex long-acuminate. Pistillate flowers have tepals 2-4 mm, the apex acuminate or mucronulate. Staminate flowers have 5 unequal tepals, 2-4 mm, the apex acute; inner tepals have a prominent midrib, excurrent as rigid spine. Fruits: Circumscissile capsules, tan, red, or brown, subglobose, the walls thin and obscurely rugose; seeds less than 1 mm, obovoid-lenticular, red-brown to blackish and shiny when fully ripe. Ecology: Widespread weed, grows quickly in disturbed areas, abundant in river bottoms and irrigated land; 0-5,500 ft (1676 m); flowers summer-fall. Distribution: Originally native to the American southwest, now widespread across the N. Amer. from n MEX to CAN. Notes: Amaranthus species are notoriously difficult and commonly misidentified. Pay close attention to the following characters and take samples if unsure. A. palmeri distinguished by its erect, annual habit, which can reach 3 m tall in the right conditions; inflorescences of terminal, mostly-leafless spikes, some of these becoming large; occasional small glomerules of flowers but not well-developed spikes in the leaf axils; and male and female flowers on separate plants. 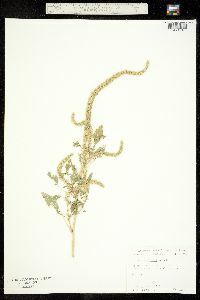 Can appear similar to A. powellii and A. hybridus, but those species are monoecious (male and female flowers on the same plant), and have wider, erect spikes found on branch tips and in leaf axils. 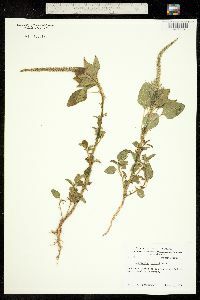 Ethnobotany: Amaranthus spp. all have similar medicinal qualities. Tea made from leaves is used to relieve stomach pain. Herb stimulates mucous membranes. Leaves mixed with lavender may be steeped in milk for infants that are undergoing continuous vomiting. It has been used for a longer than a millennium for food by various indigenous groups. The seeds are ground into meal and the leaves are high in vitamins and minerals, excellent as greens or cooked like spinach. Synonyms: None Editor: SBuckley 2010, FSCoburn 2014, AHazelton 2015 Etymology: Amaranthus comes from the Greek amarantos, "unfading," referring to the long-lasting flowers; palmeri is an honorific for Edward Palmer (1829-1911) an American explorer and botanical collector. Dioecious; erect, 3-10(-20) dm; lvs long- petioled, rhombic-ovate, or rhombic-lanceolate, 3-10 cm; terminal thyrse to 5 dm, 1-1.5 cm thick, the lateral ones shorter or none; bracts mostly 4-6 mm, with heavy, spinosely excurrent midvein; male fls with 5 unequal sep, the outer 3.5-4 mm, acuminate, with conspicuous, long-excurrent midvein, the inner 2.5-3 mm, obtuse or emarginate; female fls with 5 recurved-spatulate sep, the outer 3-4 mm, acute, with the midvein excurrent as a rigid point, the inner 2-2.5 mm, emarginate; fr 1.5-2 mm, circumscissile at the middle; style-branches 2(3); seed 1-1.3 mm, dark reddish-brown; 2n=32, 34. Dry soil; s. Calif. to Okla., Kans., Neb., and La., s. to Mex., and at scattered stations in our range as a weed.